I hope this to be a fun, entertaining, and informative blog about moving from Texas to Aberdeen, Scotland for family, friends, and all you other people out there. Let the adventures begin. 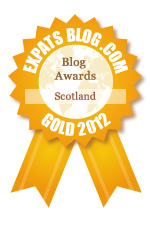 ExpatsBlog.com Expat Blog Awards 2012: Scotland Gold Award! This blog won the Gold Award for best expat blog in Scotland!